A selection of meditation stones and jewelry available with the spiral pattern. The accompanying booklet describes some of the history of this ancient, mystical symbol and gives you a short powerful centering meditation you can use anytime, anywhere, so you don’t get “lost” in the labyrinth of a hectic day. A selection of meditation stones and jewelry with a purpose made from the Indra's Net pattern. he accompanying booklet tells the story of the ancient Buddhist myth, “Indra’s Net”, a teaching story about the interconnectedness of all life and how we all reflect each other like glittering jewels, therefore what happens to any of us happens to all of us. The meditation provided in the booklet is designed to help you remember that each person is connected in the invisible, indestructible, Net of Life. Sweet small hearts with om symbol in a variety of lively glazes! The om symbol represents the sacred sound of the Universe. Fun to collect, give, arrange -- make any place special with an om heart! 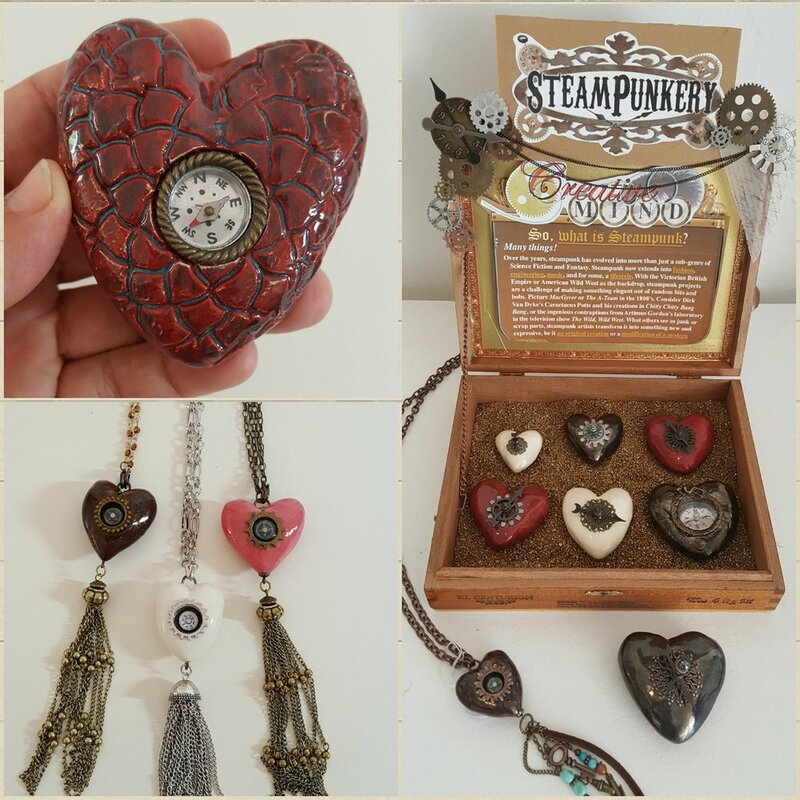 Irresistible small hearts in a variety of lively glazes! Size and shape ranges from 1.5” - 2.25” diameter. Fun to collect, hold, give, arrange and adore! 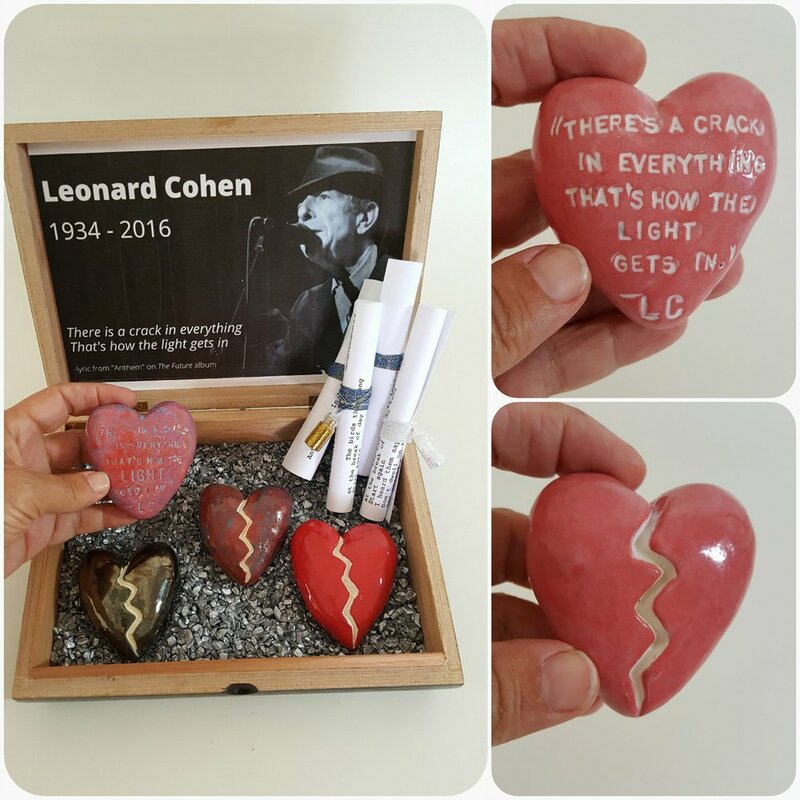 Heart Maps, available at Juicy Creatives studio, many inspiring retail locations and this website, are completely handmade ceramic hearts created by heARTist EliseCrohn in Lake Worth FL. A Heart Map is a heart shaped touchstone and meditation tool designed to help you align with timeless spiritual truths. Each Heart Map comes with a small booklet that tells the story of a particular “Heart Map” along with a meditation you can practice with your Heart that helps you center and align with higher truths bringing peace and well being. So just what IS a “Heart Map”? We all hold deep in our hearts a story about what it means to be a living human being on planet Earth. This story functions much like a road map, guiding our decisions at every crossroad. 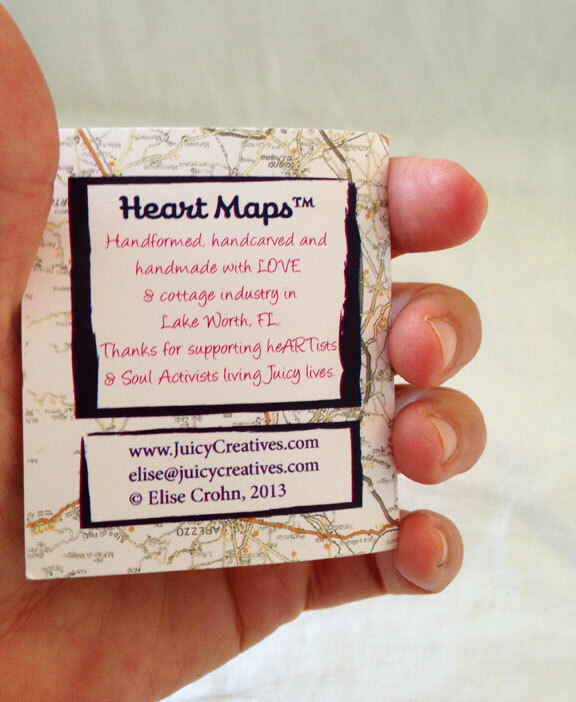 Often our “Heart Map” is outdated and contains roads that lead us nowhere or to places of isolation and unhappiness. Elisecreated these heart shaped touchstones hand carved with a symbol representing a myth or story of timeless holistic truths to remind us of the very best ideas human cultures throughout the world have come up with to guide our daily lives. By holding and using these clay hearts in meditation you can make your Heart Map conscious and choose a map that will lead you to greater happiness and fulfillment. This Heart Map is deeply carved with a spiral shape on the front and the word “Life” on the back and glazed in many colors of the rainbow. The accompanying booklet describes some of the history of this ancient, mystical symbol and gives you a short powerful centering meditation you can use anytime, anywhere, so you don’t get “lost” in the labyrinth of a hectic day. This Heart Map is carved with a pattern of lines that resembles a net, where each line of the net crosses a glittering Swarovski crystal is embedded into the heart. The accompanying booklet tells the story of the ancient Buddhist myth, “Indra’s Net”, a teaching story about the interconnectedness of all life and how we all reflect each other like glittering jewels, therefore what happens to any of us happens to all of us. The meditation provided in the booklet is designed to help you remember that each person is connected in the invisible, indestructible, Net of Life.